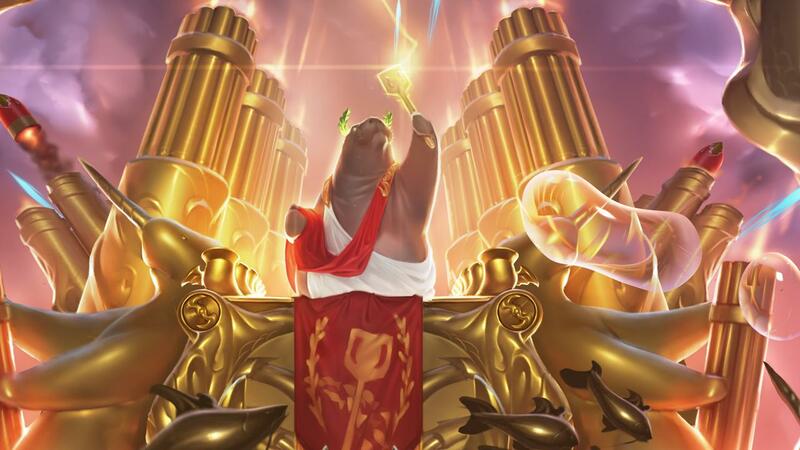 Tonight's red post collection includes the end of URF, the announcement of a Party IP Weekend this weekend, a heads up on changes to Gifting restrictions, Hippalus noting the upcoming release of Mystery icons, Meddler with discussion on Bard, Mordekaiser, and Nasus, and more! The 13th of April is here and, sadly, U.R.F has swam back to the featured game mode team's lab for now. As a thank you for enjoying all that is URF, a Party IP Weekend is coming up next weekend! "It’s been an intense fortnight, and we’re still finding new ways to break--we mean expertly min-max--Bard’s insane cooldowns, not to mention the terrorcopter of a war horse that still managed to trample through our nightmares despite his hobbled heels. Meddler has commented that a tentative bug fix should go out in 5.8 that allows Twitch to be able to hit inhibitors and the Nexus while Rat-Ta-Tat-Tat (R) is active. "Thanks for the report, that bug should be fixed in the next patch (5.8), barring any unforeseen problems." CertainlyT is some kind of dark scripting wizard." "Due to legacy code that would be surprisingly painful to fix (it's on our todo list, but we'd have to potentially test 600+ skills against it and wouldn't get too much of a gain from it) inhibitors and the nexus do not register missile hits--they just don't fire the TargetExecute block. So instead CertainlyT checks in a very small radius around the missile repeatedly to see if he can find an attackable inhibitor around it, and if so does damage to it, making sure to only damage it once. Yup. That level of dark wizard." As of the 4/9 PBE update, this bug fix / change has been implemented on the PBE. Riot is easing up a bit on some of the gifting restrictions that are currently in place, including upping the amount of gifts that can be sent each date, lowering the level and friendship time requirements for sending and receiving, and more! "You asked for looser restrictions on gifting so we’re relaxing them across the board. From now on, these changes will be in effect on all content and RP gifting. The player receiving RP needs to have been on your buddy list for at least 1 day (was 2 weeks)"
"Our Player Support team has gotten much better at detecting fraud and reversing purchases when necessary, even with gifting. So we no longer need a 2 week window to deter fraud. Subject to change of course!" One hawk eyed redditor noticed that an option to purchase a Mystery Icon for 150 RP was temporarily added to the in-game shop earlier tonight. Now removed, the option unlocked the Astronaut Poro summoner icon for the user. "The store devs are working out some kinks with the feature. It will be live at some point this week." "When it goes live, we'll give you a full list." "We're pretty happy with him overall. Does he scale into enormous amounts of damage? Yup. But he does so as an extremely immobile champion, who, even with an incredibly stacked Q can be kited by a team with at least a bit of crowd control. That creates a bunch of interesting play around shutting him down, versus, as Nasus/his allies, trying to find ways to get him face time on a target. It also means that, unlike some other immobile fighters, he's got a clear purpose late game. If you can get him onto a tower, or a squishy target, it'll pay dividends, so is well worth coordinating around. Possible we might tweak a couple of things at some point (ranges or passive amount for example), no immediate plans to do so. It's also worth noting the current meta should be pretty favorable to Nasus (longer fights, some other top laners that also want to farm a lot) which probably gives him a bit of a boost right now." "Agreed, his laning can be a bit passive at times. I don't think it's inherently a problem if the onus to be aggressive is consistently on one champion (not Nasus in this case). Where I think we do see issues is where aggressive action's just not rewarding, in large part because of the Lifesteal from his passive. Could see an argument for nerfing that (and potentially shifting the power elsewhere if appropriate) if we conclude at some point he needs a clearer early weakness. It does currently allow him to function in a range of lanes he'd otherwise really struggle in however, so not personally seeing a need to change it right now." "I do feel it's fair that Siphoning Strike affects tower, whilst Rengar Q and Sejuani W don't. Building destruction is one of Nasus' core strengths, in part so that he's always at least a moderate threat even if your team can stay away from him forever. It's something he needs to function. Rengar by contrast's there to kill a dude a bunch (and then either get out or kill more dudes), bringing mobility and stronger (over a short duration) lockdown. Sejuani's got a lot of CC, most of it AOE and she's there to lock down and control team fights. Neither of them needs to be strong at destroying structures to be useful members of a team." "We're on a similar same page - Creeping Death's being changed to be instant cast on allies as well, not just on Morde himself." "I'd expect we'd need to cut significant power from those champions somewhere if making those effects self+ally, Kayle's ult especially. In Morde's case we felt it was the appropriate call, given we wanted to add some power to him and he offered no team utility at all outside of his ghost. Those three are in reasonable (or reasonable ish at least) spots balance wise by contrast and bring significant utility already." This change is currently on the PBE for testing. "Yeah, the XP rewards for Chimes could potentially stand to be higher. We're planning on testing Chimes giving more XP based off game time this week, along with a couple of other small Bard buffs (an adjustment so Chimes don't spawn deep in the enemy jungle in the first 5 minutes and a slight increases to the speed/range of Q). We're keeping buff testing light on him for a little bit since we're still assessing the impact of the 5.7 changes. He's definitely in a significantly better spot, and probably still has some untapped performance, but's probably still on the weak side too." "We've got 6 champs in the pipeline at the moment. Those range from pretty close to complete (next champion due out) to just started and nothing but some initial ideas about possible directions on paper." "It's very likely that, as per last year, there'll be some variance in the time between champion releases, with some shorter gaps between champions too." "XERATH: There's a known bug if you double-tap R too fast he'll blop himself with his first shot. Workaround: tap R a lil' slower please!" "Looking into a fix, but if it does get found it'll be a fix that needs to piggyback something bigger (deploys cause a lot of stress, hey)."